Done under the supervision and control auf RAC Germany in U.A.E. OILFIELD BED TRUCK. Kenworth 953A. Completely refurbished. 6 new sand Tires 21.00 x 25. Flip over 3 ½” 5th wheel. Tail skirt and live roll. The radiator were taken apart and new radiator cores were installed. The top and bottom radiator tanks were checked for corrosion and replaced with new tanks if necessary. Clark front drive steering differentials were completely taken a part and all parts checked for wear and damage. Any damaged or worn parts were replaced with new Original Manufacture’s parts. All oil seals and gaskets were replaced with parts. Brand new Caterpillar 3408 truck engine with new alternator, starter, turbo-charger and exhaust manifolds from Caterpillar installed. 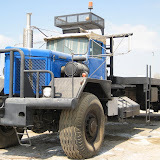 Hood and Fenders and the mounting systems of the rebuild oilfield truck KW 953A were checked for wear and damages. All damaged or worn parts were repaired or replaced as required. All rubber anti vibration rubber bushings were replaced with new rubber bushings. All Headlights signal lights, back up lights and rear signal, tail and brake light assemblies were replaced with new assemblies. 6 brand new sand tires were installed. Tire size: 21.00 x 25. The widest possible tire size is 26.5 x 25. CLARK Center Differential was completely taken apart and all worn or damaged parts were replaced with Original Manufacture’s parts. All oil seals and gaskets were replaced with new spare parts. The outer end planetary reduction assemblies were taken apart and all gears, pins and bushings checked for wear or damage and were replaced. Braden MS 50 winch or Tulsa 80 winch. Pulling Capacity: 100,000 Lbs. The winch was ompletely taken apart and checked for wear all worn parts were replaced with new parts. Refurbished oil field truck Kenworth 953. The cab with new seats, gauges, electrical switches, breakers, wiring harness etc. The CLARK torque converter was completely taken apart and all required internal parts were checked and replaced with genuine Clark parts. The CLARK 8-speed power shift transmission was completely taken apart and all internal parts checked for wear and where required replaced with genuine Clark parts. The complete KW 953A oilfield bed truck was sandblasted and painted with high quality primer and paint. The frame of the unit is painted in black color. 31 feet oilfield bed on KW 953A truck The bed is executed in 10 mm checkered plates from fifth wheel box to the winch. From the back roll to the front of the fifth wheel box the bed is executed with 19 mm flat steel plates. All cross members on bed are on a 12 inch center. Air lift center roller installed. Flip over 3½” fifth-wheel was taken apart and replaced. Rear roller and live roll was completely taken apart and heavy duty roller bearings installed. Drivelines were inspected for wear or damage and replaced as required. All Driveline yokes yere checked for wear or damage and replaced. All new U-Joints were installed in all drivelines. KW 953A oilfield bedtruck. Heavy duty tail skirt and live roll taken apart and new roller bearings installed.